Food - the glorious, exquisite fundamental element to our existence. It really does deserve to be acknowledged to its full potential. This is why, when meandering along Pakington Street in Geelong, one must stop and appreciate the abundant array of eateries. And by appreciate, this of course means one must fill their stomach with the delicious food on offer. Geelong is a smooth hour long drive down the highway from Melbourne. Instead of heading straight into the city center, take a detour into Geelong West where you will find the vibrant and charming street of Pakington. Shopoholics will delight in the stores on offer, but we are here today to take a look at the best places to eat your way along the street. Starting at the northern end we stumble across Cloud 9 Bar and Lounge at number 96. This is a quaint location to stop for a morning tea or coffee and chat amongst yourselves on the comfortable couches and chairs. However, this is an even better place to spend the evening enjoying the scrumptious cocktails on offer. At nighttime, the couches and chairs become even more comfortable in the dim-lit room as you sip on a delightful drink. Moving down the street we have Panny Thai at number 129. 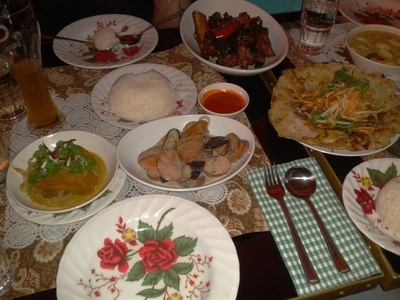 As the name suggests, this is a restaurant where you can indulge your taste buds in some tantalizing Thai food. The menu will not disappoint, with choices varying to fulfill the appetites of vegetarians and meat-eaters alike. The prices will impress as they are certainly reasonable given the filling meal you will receive. Don't forget to wash down your meal with a drink, with options on the menu to enjoy some alcoholic beverages, or for the designated driver some bubbly soft drink or a tea or coffee. Further down we cannot pass by Panache Cafe and Creperie at number 204A. Here you will not be disappointed with the selection of sweet and savoury crepes. Just reading the menu will get your mouth watering. If you're not in the mood for a crepe, then there will certainly be a cake or slice that tickles your fancy. As an accompaniment, a drink is simply a must. Anything from milkshakes and a latte are on offer at Panache. A word of advice: come to Panache on an empty stomach, because you will need as much room as you can to fit in these enormously delicious crepes. Towards the river end of Pakington at number 359 we have The Cottage, a delightfully cosy cafe that reflects the name. Breakfast, coffee, lunch, morning tea, afternoon tea...whatever you feel like, The Cottage will provide. The lively and funky atmosphere contained in the neat little cottage room provides an excellent backdrop to any eating occasion. Of course, there are plenty more eateries along Pakington Street in Geelong. These are just some suggestions to get your stomach excited, As for the rest, your taste buds will guide you there! Why? Explore Geelong, eat lots!